The story so far…………..Fluidised-bed water filtration principles were first mooted in 1947 by (Ericson E.A. et al) and later suggested to be ‘feasible with care’ by (Onozuka Y./Thorgerson S. et al) in Sweden 1955. Research and development commenced in 1959 at the Inland Fisheries research Centre in Trondheim with funding from the University of Applied Sciences in Vancouver (Marine Department). The actual principle of attempting to present tiny moving surfaces into an incoming water flow laden with aquatic detritus became a reality in 1963 when Professor Ernst Meyermiester and his young student Peter Waddington used empty wooden wine casks linked together by a complex series of latex connectors and steel bands later to be developed into items used for household plumbing installations. In 1970 Ernst was sadly carried away by an enormous meandering Fish Eagle as he was climbing out of a hot spa in his mountain home, never to be seen again. His research was only partially complete before he vanished although several of his theses were presented to the Royal Horticultural Society in London lauding the agricultural value of the waste products produced by fluidised-bed technology for agricultural cultivation – notably in tomato production. Thankfully Peter Waddington doggedly continued with his teacher’s findings and became an internationally-renowned world leader of fluidised bed technology in later years. He caused many raised eyebrows at a lecture he gave to the Oxford University Debating Society in 1989 when he warned that (quote) ‘the age of string vests and ‘Y-Fronts’ had come to an end’ and then predicted that moving-bed water filtration technology would become an household word by the early part of the 21st. Century – it is only now we see how uncannily true and accurate his words would actually become. Alas, it was at a world symposium for Third World drinking water production in 2004 when a member of the audience interrupted a particularly fine lecture of his and said ‘It’s only a load of plastic beads driven around by aeration’ that Peter exploded and tore into the offender after a spectacular leap from the podium. Security Officers tore Peter away from the unknown heckler but not before one ear of his antagonist had been removed in the fracas. Peter was sentenced to three years imprisonment and now runs his own consultancy company dedicated to fluidised-bed water filtration solutions for all forms of intensive fish farming applications. E1 – Single-Bed. Apply at 1 kilo to 1 cubic metre of bedroom after soaking in neat sulphuric acid for 1 hour (to remove film). This will give perfect water conditions to 30 nisai up to 42cms but increased stocking can be achieved by adding 2 particles of E2 (see below). We also have seen significant added growth by using our ‘ERIC Booster’ foods. E2 – Sofa-Bed. Mostly used for deep sea Halibut farming but has also been used with enormous success with lustre-enhancing qualities on female Beni Kumonryu; Hageshiro; Kin Kabuto and other such junk. We recommend ‘ERIC Base’ foods here. E3 – Double-Bed. Our biggest seller to date, no need to use any ‘de-filming’ on this one as each piece is hand-scrubbed before packing. One kilo will keep 50 gosai (69cms) in 100 litres of bedroom providing all U/V’s are switched off permanently. No doubt, our ever-popular ‘ERIC All-Year’ foods produce the very best results here. E4 – Kingsize-Bed. Only for jumbo Koi but also deadly in the farming of Elephant Seals and Hippo. It has slight combustible properties in transportation and there have been a few unfortunate accidents but the results are truly staggering. Use ‘ERIC Magnum’ foods available in three kilo chunks (100 per outer) – only available from ‘ERIC Master Dealer’ outlets. Now, as we all know by now, our fluidised beds, no matter how efficient, are of little use without the fluidised bedrooms in which to house them. 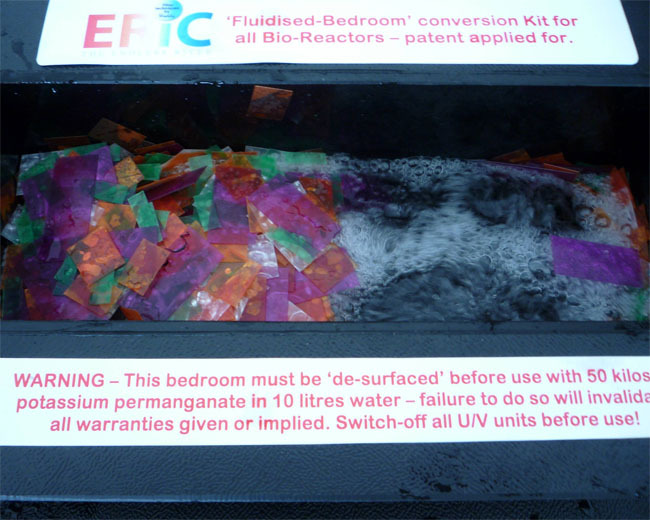 I launched my first fluidised-bedroom conversion kit at the recent BKKS ‘Koi 2009’ show where it was met with significant success after some private demonstrations to leading UK Koi enthusiasts who stood back in complete amazement after witnessing my latest invention for the very first time. Before I carried out these groundbreaking demonstrations all cameras had to be checked in for security reasons and potential industrial espionage threats. This is the first-ever seen working photograph of my largest bedroom to date – aptly named ‘The Dormitory’. Naturally, as with anything so sophisticated and complex, purchase price is high at the present time but I hope to be able to reduce prices as more enthusiasts realise just how vital my units are to their hobby. This unit is the only one that can house a mixture of all my fluidised-beds and our research team promise that ‘bunk-bed media’ will be available by the end of 2010. ‘The Dormitory’ you see here has been specially produced to fit perfectly into a standard ERIC bio-reactor unit that has now become the industry standard for Koi pond filtration the world over. 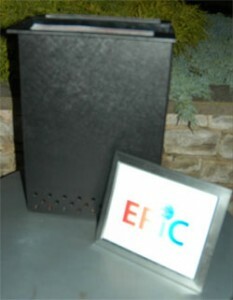 I have now appointed my first ‘Master Dealer’ for the UK and the entire range of ERIC units will be on sale at all B&Q outlets by the end of summer 2009. This picture has been taken to show how the king-sized beds and double beds avoid each other during fluidisation which is, of course, of paramount importance. A rare evening shot of ‘The Dormitory’ taken whilst the beds are being ‘made-up’ for the night. Genius or Kidology? – You be the judge of that.